Captaintreacherous, rested and reportedly in fine fettle, is the star of the sport’s first million-dollar race, this year worth $635,750, The Meadowlands Pace. He is the morning-line favorite and it would still be generous to get those odds on him. 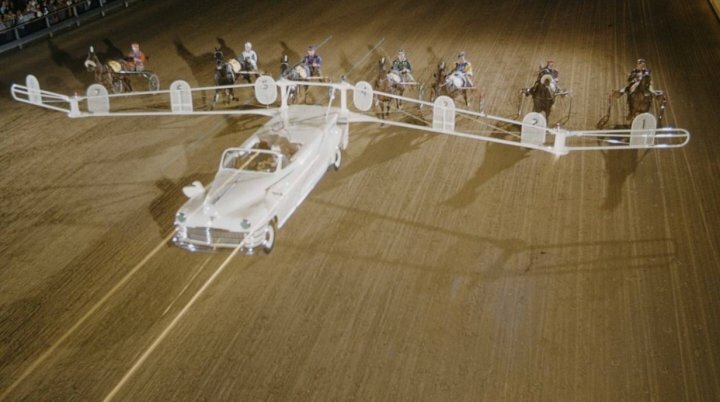 Also at the Meadowlands is the William Haughton Memorial final, New Jersey Sires Stakes finals, the Mistletoe Shalee and The soph-colt-and-filly trotting events—the Stanley Dancer and Del Miller memorials—we cover on the Hambletonian Trail at the exclusive blog. 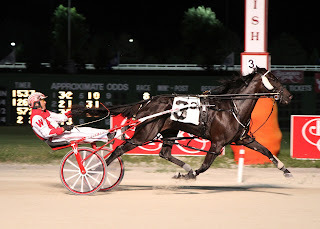 Our exclusive harness horses to watch (H2W) list from tracks around North America continues with a few extra additions this week, when so many tracks are filled with overnight racing bargains. Captaintreacherous, the defending Pacer of the Year, is coming off of a hellish-mile in the Max Hempt Final, where regardless of the grind in the slop from the outside he emerged victorious. The “Captain” is without debate the one to beat in this field, as he will be in any field with his division until he proves vulnerable. Adding into the mix of this race are impressive miles by Sunshine Beach and Odds On Equuleus in the elimination last week. This opens up the race but not greatly. Adding all the variables into the race, Captaintreacherous is still the best in this field. He may not be the kind of value he has offered over the past two months, even though there are still “dragon-slayers” promoting the vengeance of foes he has already beat handily. The Captain is ready for some home cooking, so to speak. This won’t be a high payoff year for the pace on any level of wagering but it will be a great race to watch. After all, it is getting so any race involving Captaintreacherous is a great race to watch. As well, he has turned into a monstrous exotic key horse. Over the last three years the Mistletoe Shalee has been known for its upsets, with the leader of the division coming short towards the mile’s end. Last year, American Jewel lost to 10-1 Major Look. Before that, Drop The Ball paid a healthy $12.40 and Put On A Show was greatly disappointing in the 2010 edition, finishing fifth to 9-1 Dancinwiththestarz. We will use the recent history of this race hopefully to our advantage with I Luv The Nitelife likely to be the heavy favorite. But she has weaknesses. For example, look back to the final of the New Jersey Sires Stakes. The leader of that race set the pace and I Luv The Nitelife had to go first over through fast fractions to make her move, resulting in a third-place finish. There is one horse in this field that comes in mind when thinking of upset potential, Jerseylicious. 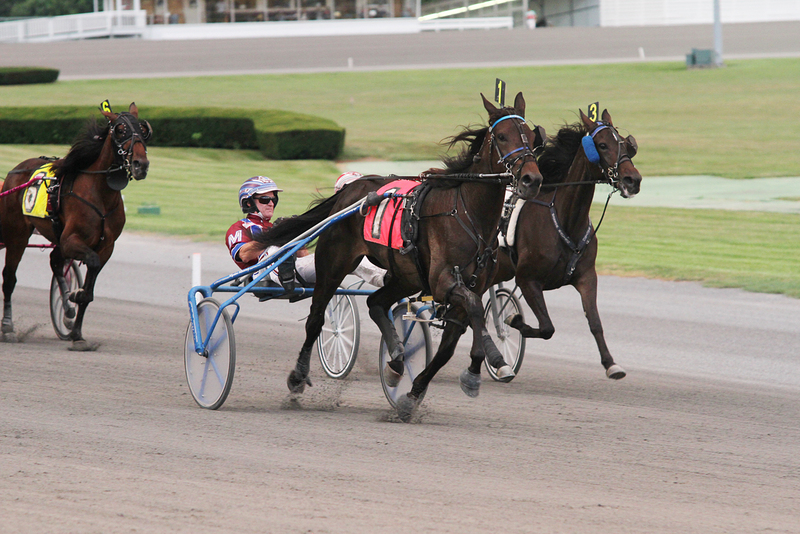 Last year, Jerseylicious got a perfect trip to pull off a 9-1 upset in the Sweetheart final at the Meadowlands. She beat I Luv The Nitelife in the sires stakes final and is coming off of two good efforts in the James Lynch. She’ll be closer to the pace instead of getting away towards the rear, as what happened in the “Lynch” final, and should get cover to follow until the stretch, where she’ll have open road for the upset. The older pacers of the William R. Haughton Memorial (WHM) are back for the July 13 final. We nailed the big price last week in the elims with Sweet Lou and we also warned you about a return to good form for Golden Receiver. He did return with vengeance, finishing second to Warrawee Needy’s giant elim mile (1:46.4). “Golden” was 16-1 and with the favorite offered an exacta worth $65.20). When he stopped the timer in 1:46.4, Warrawee Needy was instantly stamped as the one to beat in the final. He and Golden Receiver are likely be bet the heaviest, since Golden Receiver dug in well to Warrawee Needy’s pressure. It appears that the other elimination winner, Sweet Lou, might provide us again with some value in the win column. Sweet Lou gets a better post this week, which will help him greatly after winning from post 9 through slow fractions in his elimination. His post will allow him to get away near the top, which means he won’t have to close much ground. 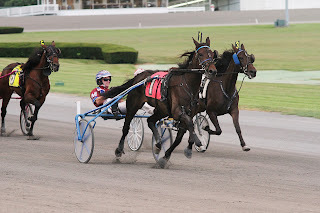 He has shown he is capable of racing from the middle, closing to win the Meadowlands Maturity and coming from fifth to finish second with a horrible trip in a Free For All (FFA) event at the Meadowlands. If he is above 4-1, then the value indeed exists. Also keep your eyes on Up The Credit. He isn’t a definite bet in the exotics but he has been showing great improvement against the FFA gang and has also done better from off the pace. His post will allow him to close and he can close well. If you’re out for a kill, he is one to key into exotics. The New Jersey Sires Stakes (NJSS) finals for freshmen offer a quartet of miles for the youngsters on both gaits for $150,000 each. First on the docket is the frosh-filly trot final. Southwind Confetti broke after a big move last week, one that may have seen the light of the winner’s circle. We will go with her this time around. In the colt trot, Muscle Midas went a long way at 90-1 for third in his first trip to the Meadowlands and he could find coming from behind a plus at a big price here where the favorites are much too obvious. The colt pace is next and all eyes (plus most dollars) are on Western Vintage. But we like the improving Sweet Rock, who was right behind that one last week and could find post 8 a better path to victory if he is driven with a plan, which could be the case with John Campbell aboard looking to pull off one of his second-over victories in deep stretch. In the filly pace we will once again support Danielles All Aces, looking for a clean-gaited performance which puts her deeply in the mix.